This entire story starts with a man named Pythagoras, born around 570 BCE on the island of Samos in the Aegean Sea. Now well-known for his famous Theorem, which states that square of the length of the longest side of a right triangle is equal to the sum of the squares of the short sides, Pythagoras was also a respected philosopher and had a considerable following. The Pythagoreans, as they were called, adapted the pentagram as their symbol, as it represented health, and, more interestingly, what is now known as the Golden Ratio (see here for more information regarding the Ratio's appearance). It is possible to establish a rigorous proof that the diagonal and the side of the pentagon are "incommensurable," i.e, that the ratio of their lengths cannot be expressed as a ratio of whole numbers.Therefore, phi is shown to be an irrational number. It has been suggested by several researchers that the Pythagoreans' discovery of this was the first appearance of incommensurability in history (Livio "Story," 24-36). "The Pythagorean worldview was based on an extreme admiration for the arithmos--the intrinsic properties of whole numbers or their ratios—and their presumed role in the cosmos. The realization that there exist numbers, like the Golden Ratio, that go on forever without displaying any repetition or pattern caused a true philosophical crisis" (Livio "Story," 4). In only the fifth century BCE, then, our favorite number had already started making waves. 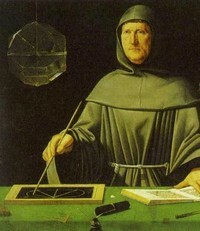 The phenomenon of the Golden Ratio settled down for several centuries after the Greeks, only to be revitalized during the European Renaissance by Italian mathematician Luca Pacioli and his three-volume treatise entitled Divina Proportione, which contains a detailed study of the Golden Ratio and polyhedral solids. In fact, Pacioli is most likely the cause of today's widespread fascination with phi. In his work, Pacioli replaced the rather intimidating names for the now-famous Ratio (names like"extreme and mean ratio" or "proportion having a mean and two extremes"), referring to it instead as the Divine Proportion. "The infusion of theological/philosophical meaning into the name ("Divine Proportion") also singled out the Golden Ratio as a mathematical topic into which an increasingly eclectic group of intellectuals could delve. Finally, with Pacioli's book, the Golden Ratio started to become available to artists in theoretical treatises that were not overly mathematical, that they could actually use" (Livio, "Story" 136). And thus began the slippery slope from mathematics to phenomenon. For whatever reason, the concept of the Golden Ratio has captivated humanity for centuries and the idea of it as an ancient, powerful force pervades its very mention. Yet, its name only came into existence around the 1830's and was coined by German mathematician Martin Ohm (brother of physicist Georg Simon Ohm, after whom Ohm's Law is named) (Livio, "Story" 6). The publications of Adolf Zeising in the mid- to late-nineteenth century, which focused on proportions in nature and art, did the most to bring the name into common, widespread usage.Traditionally, the Golden Ratio has been represented by the Greek letter tau in mathematics, but phi has become more common of late, and was ascribed to the number by American mathematician Mark Barr in honor of Greek architect and sculptor Phidias, who, according to legend incorporated the Ratio into his designs of the Parthenon. But, of course, we now know that this is not true (Green). Recently, phi has seen a resurgence in popularity due to its being featured in Dan Brown's immensely-popular and controversial novel The Da Vinci Code. In it, Brown makes several false claims regarding the golden ratio, all of which will be discussed in greater detail here. These claims are seem to be simply an amalgamation of today's most popular ideas about the ratio, including that it can be found in the human body (not true), and that it can be found in all sorts of art and architecture (also not true).